I just got home from a beach trip with my family. As always, it was a really great time with a little stress/chaos mixed in. Here is a gallery of photos from our 2016 trip. Before we got to the beach, my oldest niece Hannah and her boyfriend Brian flew into Charlotte to spend the day with me before we went to the beach. It was a lot of fun showing them around the city, checking out uptown, a local brewery, and getting some BBQ. We've been going to the beach for decades as a family. (Here are some photos from previous trips: 2007, and 2012.) It all started in the 80s when we rented a little house named 'Camelot'. Camelotwas just a one-story little house on stilts with a short walk via a sandy trail to the beach: it was great! My niece Hannah and I found that old house. I was very happy to discover it's still around for rent. In recent years there have been a lot more of us, which requires a much bigger house for everyone to fit. 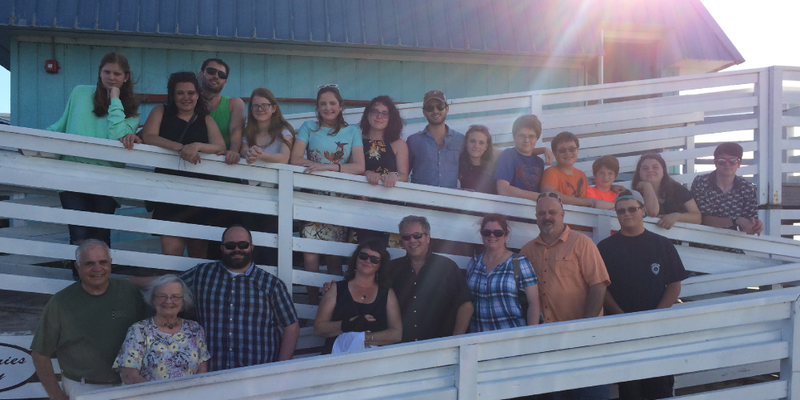 All together there were 22 of us this year (Mom, dad, my brother and his wife, my sister and her husband, my brother's 3 kids, 2 of my sister's kids, my sister-in-law's 4 kids, my brother-in-law's 3 kids, my two oldest niece's serious boyfriends, and me). The water was surprisingly cold the first few days: in the 50s. Because of the cold water there were butterfly fish were swarming in the water. The air temperature however was very high, with high humidity, creating quite the contrast between the air and the water. I can't remember the water being so cold at the Outer Banks in July, when the sand was so hot. Thankfully by the end of the week the water temperature had increased to the mid 70s, and the air humidity decreased making in a lot more pleasant. This year, as we usually do, we went to see a couple lighthouses: Bodie Island and Cape Hatteras. Lighthouses have always been an of interest of mine. 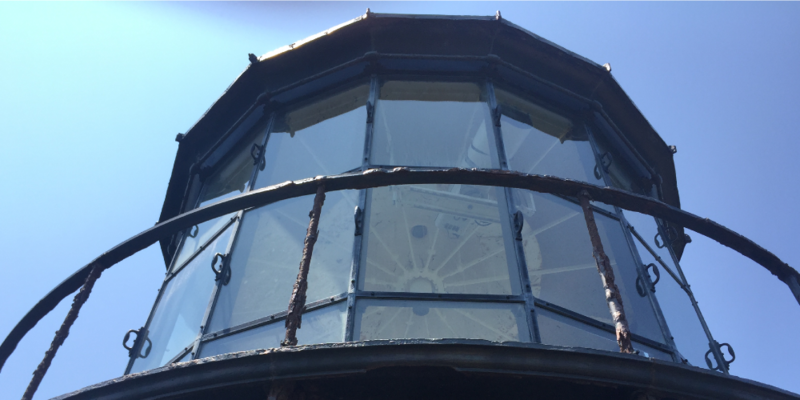 I've been to the top of Bodie Island Lighthouse, Cape Hatteras Lighthouse, and Currituck Lighthouse). This year, due to the heat, Bodie was not open for climbing to the top. But we did climb the Cape Hatteras lighthouse, which is the tallest lighthouse in the USA with 248 steps. It was quite hot inside. The outside temp was 95 degrees, and the inside temp was 104 degrees. The humidity made the inside temp feel like 117 degrees according to the weather report. It was a challenging hike up to the top. But the view made it all worth it! I usually try to take in a movie or two while I'm at the beach. This year I was able to see three films. Jenah's boyfriend Joe went with me to see the new Star Trek. My sister Dana and her husband John went with me to see the new Ghostbusters remake. And Jenah, Joe, and my dad went with me to see the new Jason Bourne movie. I hope our family continues to make these trips together! A couple weeks ago I made a trip to the San Francisco/San Jose area to attend a wedding of some of my best friends. Prior to this trip, the furthest west I'd been was Fort Worth Texas. Flying over all the country for the first time is an experience that is hard to put into words. And doing it all in about 5 hours from 30,000 feet is a bit of a shock. Once you cross the Rockies the landscape changes dramatically, both in color and grandeur. The scenery becomes surprisingly brown/beige, and the landscape becomes surprisingly massive. I couldn't help but notice that up until you cross over Nebraska, it's clear that nature is almost entirely crafted by humans. Flying over Nebraska it was impressive how square everything was. Everything was broken down into perfect squares of agriculture, the roads making a perfect grid for as far as the eye could see. But once our flight passed over southern Wyoming it was surprisingly baron. Here everything seemed barely touched by people. And as our flight passed from Nevada into Calafornia, I was amazed to see at the edge of the horizon a snow covered peak, which I later discovered was a volcanic mountain (Mt Shasta) that was over 150 miles from the location of my plane. I was lucky enough to have a window seat so I took a lot of photos. And later using Google maps I was able to pinpoint the location of the photos I took. I made a map of the trip, and created a gallery of the photos from the flight. San Francisco is such a beautiful city. The architecture was gorgeous in every direction. The temperature/climate was fantastic. 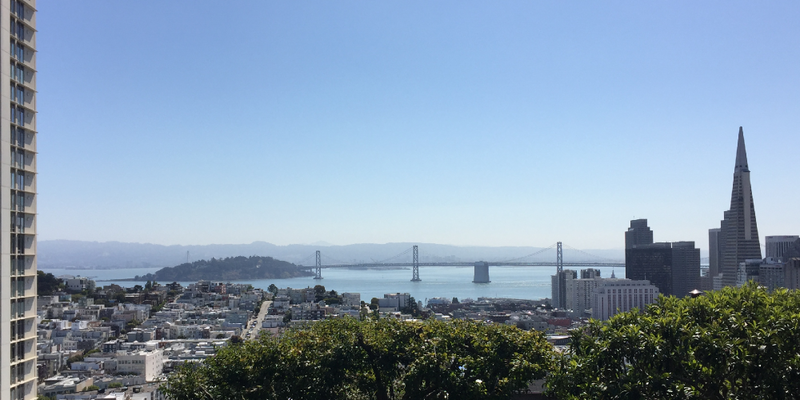 I walked quite a bit Saturday morning until I spotted several iconic landmarks, such as the Transamerica Pyramid building with the Bay Bridge in the background, Coit Tower, and the Golden Gate Bridge. Other highlights included: Hiking in the John Muir Woods National Monument and stopping by Google's Headquarters on the way back from the wedding rehersal dinner. It was a bit weird/surreal to use Google Maps to locate and visit the actual Google headquarters. We were also able to take in a Giant's game on July 4th. And afterwards I used the MUNI transit system to take a ride across town to see the Pacific Ocean. Here is a gallery of photos from the trip to San Francisco, Google, the John Muir Woods, and the Pacific Ocean.